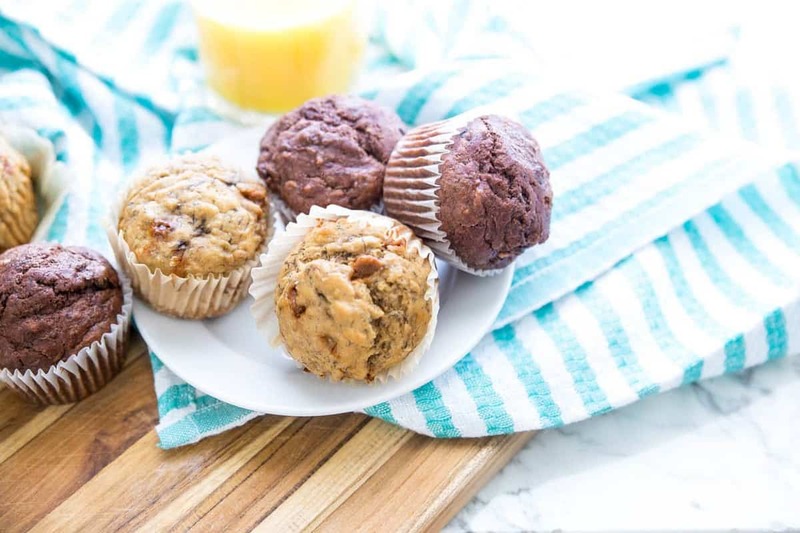 Know you want to make muffins but can’t decide on a flavor? Or maybe one kid wants one flavor and another wants something else. 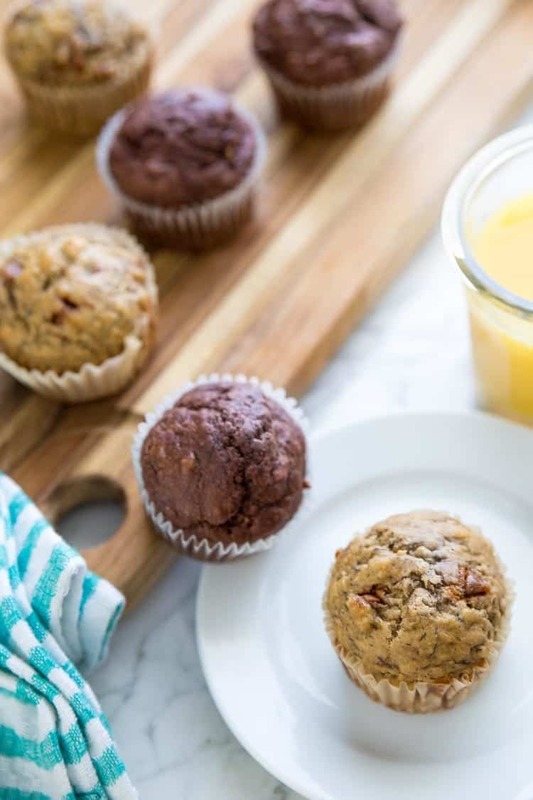 With this recipe, you can divide and conquer and make everyone happy by making these Healthy Banana Bread Muffins two different ways! I know last week I talked about the first week of summer break and how I was having a hard time getting in the groove of things. The lack of schedule was driving me crazy. My kiddo was already bored on day one. And I just wasn’t sure how I was going to survive the summer months. I kind of want to take all of that back. To my son who’s reading this 5 years in the future, I take it all back. You’ll understand when you have kids of your own why I said the things I said. But in complete reality, you truly are amazing, and this last weekend you proved that to me. 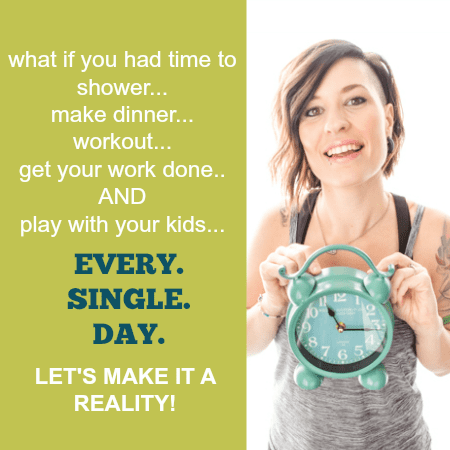 As a military wife, often I have to play the role of a single mom for some periods of time. The longest we’ve had to go without my other half was almost 8 months. A long long 8 months. Thankfully, the longest we’ve had to go since then has been about a week, but even those weeks are rough. The last 5 days, my wife had to leave for duty, and to say I was nervous about it just being me and the kiddo was an understatement. First week of summer. Boredom. No desire to do chores. Lots of wallowing around the floor waiting for me to be his entertainment committee. At least on most days, I would have the relief of the evenings when I at least had another adult in the house to talk to. So the night before she had to leave for duty, I asked if she could talk to the kiddo and make sure he knew what was expected of him while she was away. She’s the disciplinarian in the house, so I knew he’d listen to her more than he’d listen to me. Honestly though, I was still nervous that everything he was told was going in one ear and out the other. Boy, I sure don’t give that kid enough credit. First thing on Day 1 of Operation Faux-Single Mama, he woke up at 7:00. Wife was already gone. But he just got right to it. Get started on chores. Holy Check! The kid was vacuuming at 7:45am! I was amazed and had to record the event on Snapchat. I just couldn’t believe my eyes. All weekend was more of the same. Be still my heart. Do not get one day older, you hear? Of course, this was just days after watching a video of my baby when he was just 2 years old and had the cutest little baby voice. That may be another part of why I’m holding on to this age and trying maniacally to stop time. He told me just last week (after listening to the Lukas Graham song, “7 Years”) that he hopes science will advance enough to stop aging before I’m 60 years old. Gah! Why does time have to fly by so fast?! My kiddo. He surprised me with his actions this weekend. He reminded me that I have one of the best kids in the entire world. He reminded me of the bond we have as mama and son. 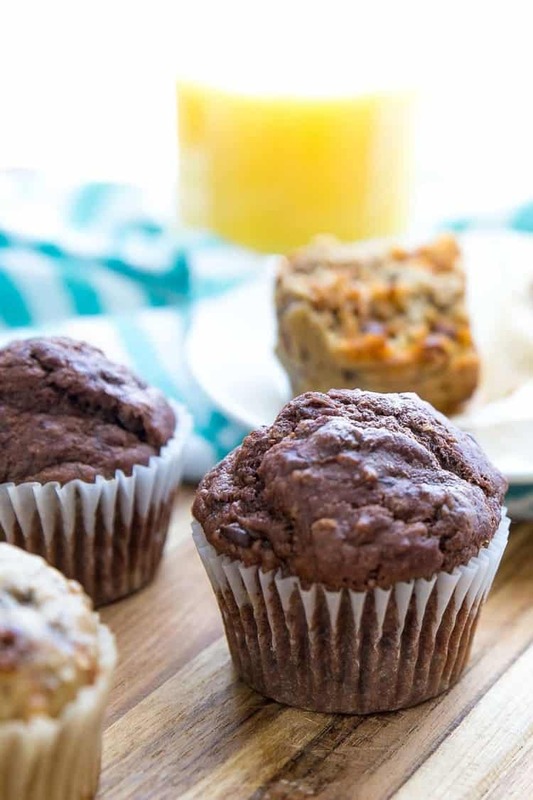 We got in the kitchen together this weekend to make muffins, but of course, we couldn’t quite agree on the flavor. I wanted peanut butter and he wanted chocolate. Thankfully the dilemma was short-lived because of his quick thinking. 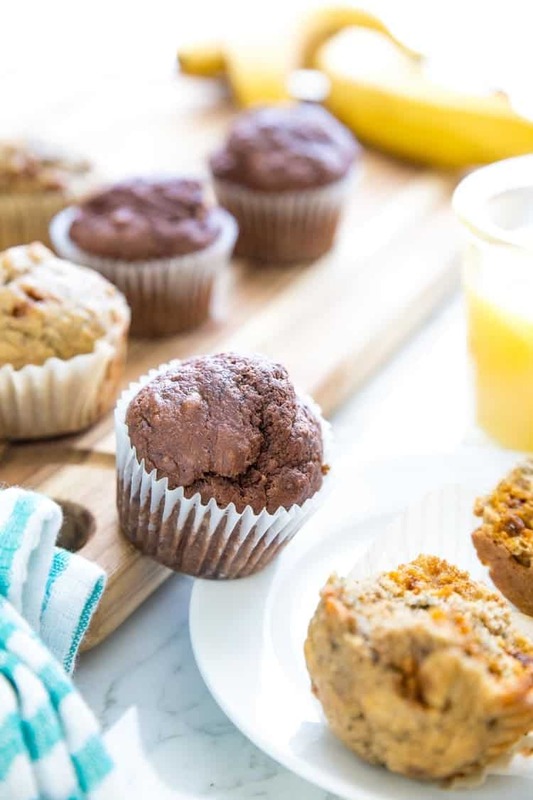 I had quite a few over-ripe bananas, so I found this to be an easy hack. Make the base of the recipe, divide in two, and conquer each batter as you see fit. One with chocolate and one with peanut butter. That kid – not only is he helpful, so so sweet, but he’s pretty dang smart, and for that I am grateful. Because when I am old and forgetful, he will be my saving grace. In a large bowl, add bananas. Using a fork mash up bananas until just very small lumps are left. Add agave, vanilla extract, greek yogurt, applesauce, and flax egg. Using a fork, mix until combined. Divide into 2 bowls. 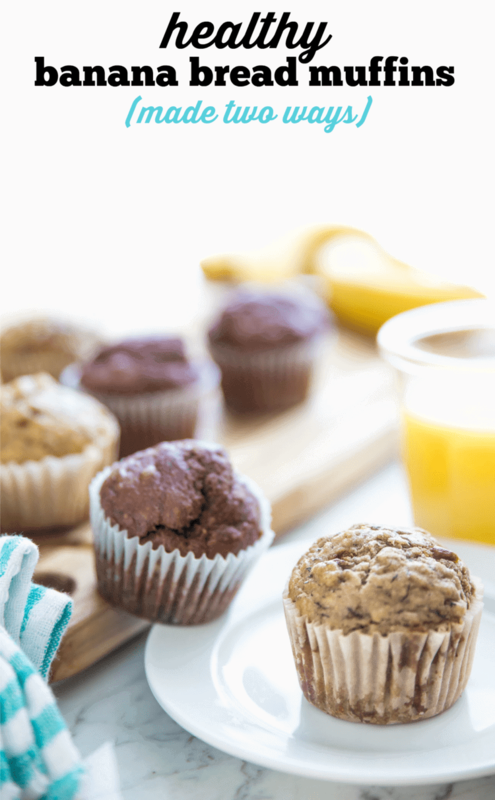 In one bowl of the banana mixture, add cocoa powder, half the flour, salt, and baking soda. Using a spatula, mix until wet and dry ingredients are completely combined. In the other bowl, add just the remaining flour, salt, and baking soda. Fold in the mini chocolate chips into the chocolate batter. Fold in the peanut butter chips into the other batter. 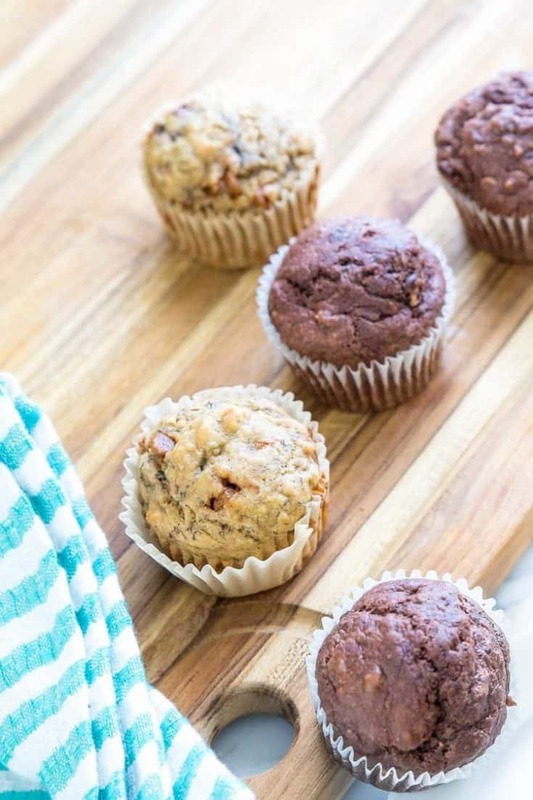 Line each muffin tin with a cupcake liner (or spray with pam so muffins don't stick to pan if not using liner). 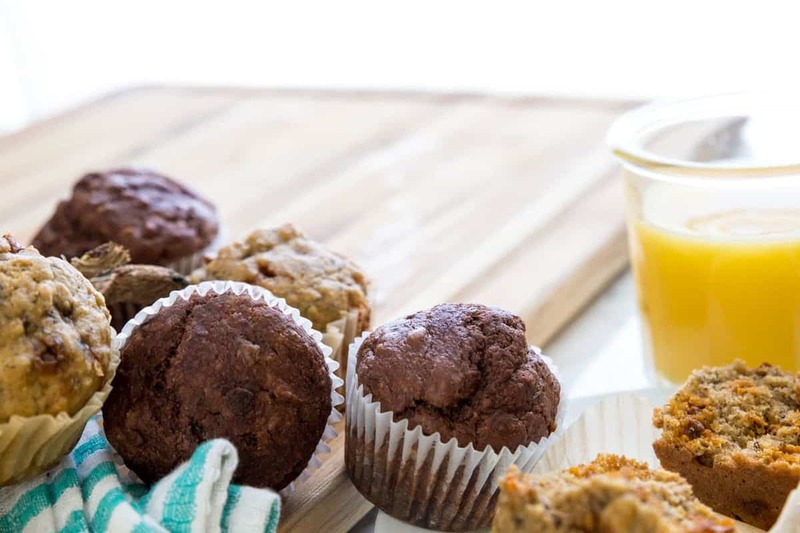 Fill each muffin tin ¾ of the way full. We’ve spent a lot of time in the kitchen since the boys have been off from school too. It’s a great way to teach them something, entertain them, and spend time together. 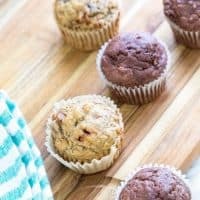 I bet my boys would love these muffins! Printing out your recipe to try soon! Yes, anything I can do to get my kiddo away from those darn video games and in the kitchen with his mama is a win for me! 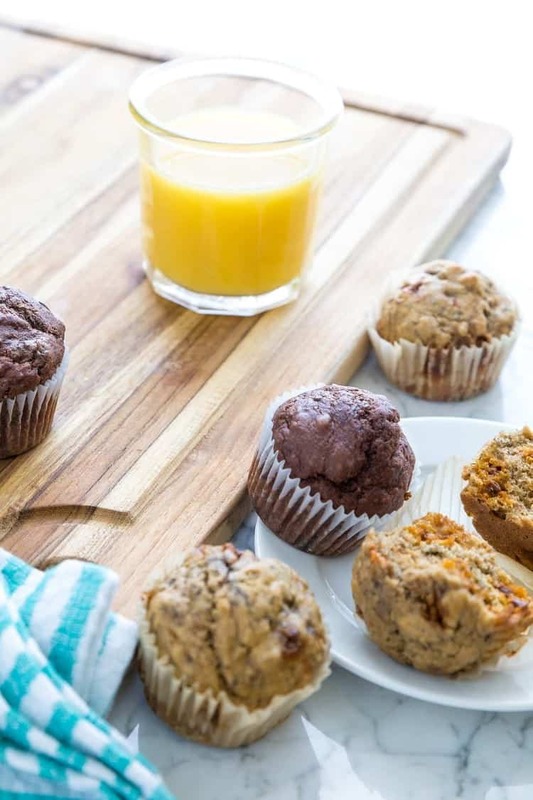 I hope you and your kiddos get to try the recipe out soon!